At Bergey's Ford of Ambler, we're so excited that Ford has brought back the Ranger pickup truck. The all-new Ford Ranger is a midsize truck packed with a lot of features. A lot of technology is dedicated to helping you stay safer on the roads. 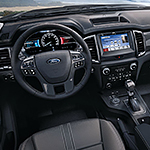 The Ford Co-Pilot 360 includes plenty of driver-assist technologies to show you what's going on in traffic. This includes blind spot monitoring, lane-keep assist, and pre-collision assist. You will also have adaptive cruise control and brake support. Other technology ensures you enjoy yourself on the road. You'll love the voice-activated SYNC 3 and FordPass Connect so that you can connect with your music and navigation without using your hands. You can listen to music with a sound system by Bang & Olufsen. Plus, you can connect your phone to have more apps at your fingertips with either Apple CarPlay or Android Auto.